Having color-treated hair is not easy at all. Once the roots start to show, I'm getting conscious because of the uneven color. Aside from this dilemma, I also consider the texture and the state of my hair strands after a month of hair dye application. Color-treated hair are considered 'abused' hair because most of the health-stripping nutrients are found in these chemicals. The more we color our hair, the more it is susceptible to damages like breakage, split-ends, coarseness, dryness and stiffness. Other kinds of after coloring effects may include scalp irritation and hair fall. I've been sporting color-treated hair for the longest time now. It's been 4 years and sometimes I feel 'naked' when the roots start to show. 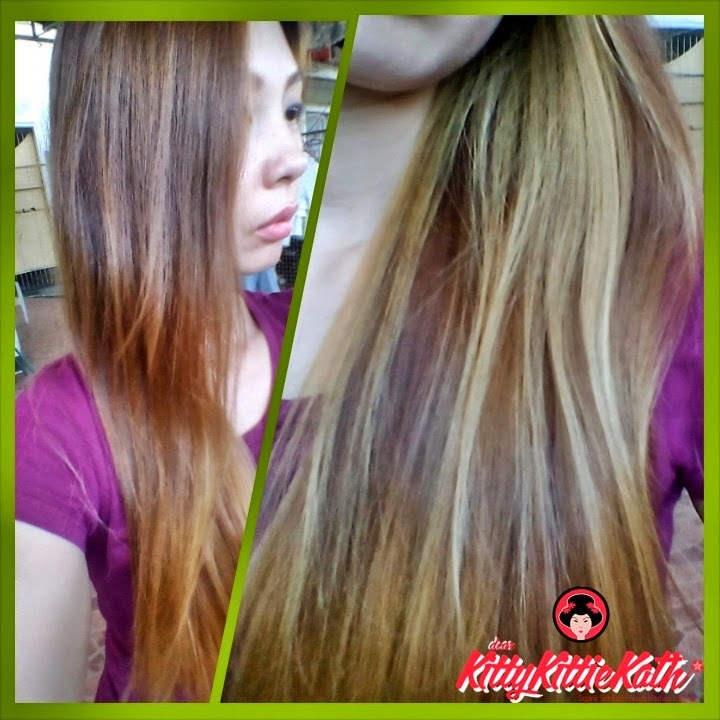 My last hair color (Balayage Ombre by Azta Urban Salon) and hair treatment (Oi Oil) were from Davines. Their products are specifically crafted from nature to meet your hair's every need and based from my experience, my hair is still in good shape after the last hair color and treatment I've had. Anyhoo, Davines gave me one of their best-selling hair treatment as a gift last Christmas. I'm so excited to use the product because I've read positive reviews about this hair mask. 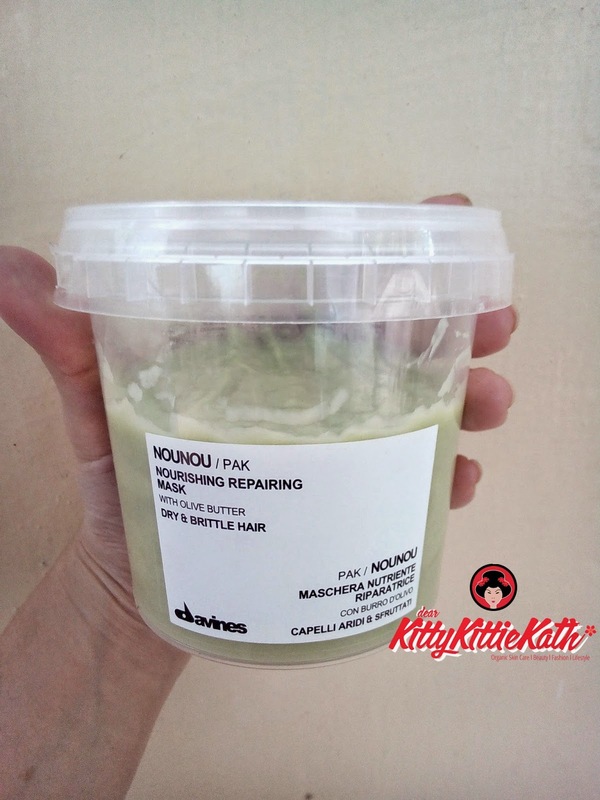 So without further ado, here's my honest to goodness review of Davines Nounou Pak. The name may sound funny but it's serious in nourishing my hair from roots to tips! Click CONTINUE READING for more information. After 4 uses (I use it twice a week), my hair looks healthy and shiny again. Made my hair's color vibrant. If you're a long time reader of this blog, prolly you've seen my last hair color treatment and it has been 4 months so it is natural that the color starts to fade by now. I'm expecting that it will fade unevenly with unhealthy looking ends but after using Davines Nounou Pak, it faded the way I like it- shiny and vibrant! The color of this hair mask is avocado green. size: 250 ml e 8.45 fl. oz. Available at selected salons nationwide. instruction for use: Distribute evenly on towel dried hair and massage in gently. Comb through and leave it work for 10-15 minutes then rinse carefully. Here's a dollop of Davines Nounou Pak. The texture is very thick. Here's my hair after running errands. I usually ride a tricycle from our house then another jeepney ride to my destination. Wind-blown hair, here, there and everywhere. After combing my hair using my fingers, less coarse and fly-away indeed. The color of my hair is still vibrant and shiny. I like the packaging for being simple and it is eco-friendly since this is one of Davines' Sustainable Beauty Manifesto. The texture of the product is very thick and rich. It's easy to spread and becomes creamy once applied on hair and scalp. It's easy to apply, just use a comb so that the it will not get stiff. After 10 minutes, my hair is soft and smooth to touch. The color of my hair became vibrant. Less limp and coarse hair the next day upon waking up. After 4 uses (twice a week), I experienced less hair fall and tangles. The price- a bit pricey for ladies with tight budget. The scent- it's herbalish that I don't know how to describe exactly. Not easily accessible since this is only available at selected salons nationwide. No manufacturing, batch and expiry date printed on the tub. I give this a 4.75/5 rating. Always follow the instructions because even though the product is dubbed as natural or organic, some people may be susceptible to allergy from one of the ingredients but none the less, this is a product worth trying because my hair became soft and shiny every after use. If your hair is prone to damage due to chemical processes like rebonding, straightening, coloring, perming then this product is for you. I like that Davines Nounou Pak made my color-treated hair vibrant and healthy. Since this product is very intensive, I suggest you to apply this once or twice a week. Have you tried Davines Nounou Pak Nourishing Repairing Mask before? What's your care regimen? DISCLAIMER: This product was gifted to me by Davines Philippines. The views expressed here are my honest opinion about the product. We have different hair types, what works for me may not work for you or vise versa. Would love to try the mask!